The DIGIHELICÂ® II has the same features as the DH Standard Series but it's in a NEMA 4 Enclousure. The DigihelicÂ® differential pressure controller is a 3-in-1 instrument possessing a digital display gauge, control relay switches, and a transmitter with current output. Combining these three features is a cost efficient way to save on the number of instruments needed to measure pressure, velocity and flow. The DigihelicÂ® can achieve a 0.5% full scale accuracy, making it the perfect controller for glove boxes, hoods and clean rooms. The DigihelicÂ® allows the selection of pressure, velocity or volumetric flow operation in several commonly used engineering units. 2 SPDT control relays with adjustable dead bands are provided along with a scalable 4-20 mA process output. The DigihelicÂ® allows you to require a security code prior to any changes to the user-set programming. An easy to use, menu driven keypad also lets you set all of the following: pressure, velocity or flow operation; K-factor for use with flow sensors; rectangular or circular duct for inputting area in flow applications; set point control or set point and alarm operation; high/low alarm; automatic or manual alarm reset; alarm delay; view peak and valley process readings; digital dampening for smoothing erratic process applications; ModbusÂ® communications; and field calibration. 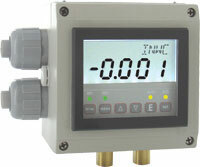 DigihelicÂ® controller is the only instrument you will need for all your pressure applications.